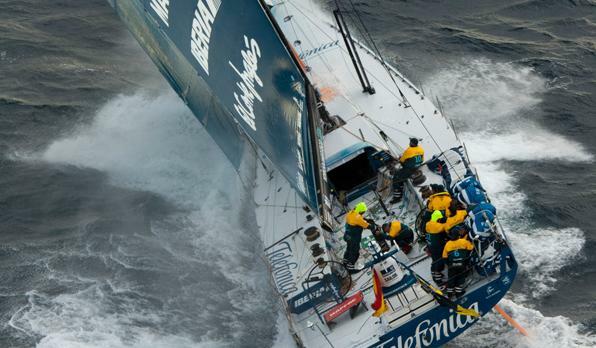 The Spanish boat Telefonica won the first stage of the second leg of the eight-month Volvo Ocean Race. It beat Camper by less than two minutes after a trek that lasted 15 days. Telefonica trailed Camper much of the past two days but overtook its rival about 8 miles before the finish in an undisclosed port in the Indian Ocean. The leg started in Cape Town but organizers have kept the locations of the boats secret for the final part of the first stage to avoid pirates off the coast of Somalia. The boats are to be shipped to a spot off the United Arab Emirates coast. The leg will be completed with a sprint into Abu Dhabi. Telefonica earned 24 points for the stage win and extended its lead over Camper by seven points in the overall standings. Camper received 20 points for finishing second. The winner of the sprint to Abu Dhabi will get six points. American team Puma were on course to finish third in the stage, ahead of Groupama. Fifth-place Abu Dhabi was unlikely to finish before Tuesday. The sixth team, Chinese entry Sanya, is carrying out repairs on the island of Madagascar and hoping to get back in the race for the third leg. The Volvo Ocean Race covers more than 45,000 miles with stops in 10 countries on five continents. It is set to finish in July in Galway, Ireland.